When my kids were little we loved the irreverent storybooks by Jon Scieszka, particularly the Stinky Cheese Man. 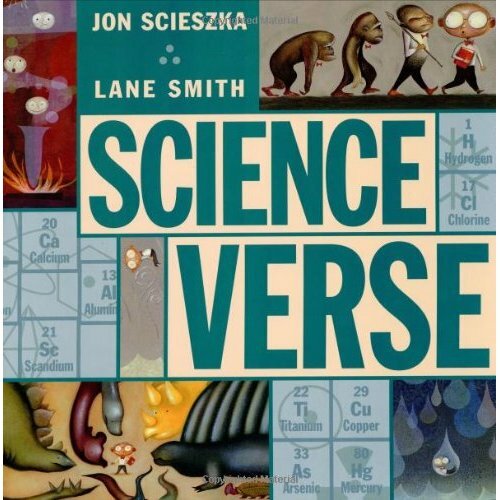 So I was delighted to discover at Powells, the best-bookstore-ever, that Scieszka and Lane Smith penned a book called Science Verse. The book promises to make science fun. Mary had a little worm. She thought it was a chigger. Other gems include take-aways on space and gas. The book’s interior includes a picture of the periodic table. As I learned at the ScienceOnline2012 conference in January, you can create your name from the elements with a little creative thinking. Mine is Carbon, Iodine, Nitrogen (CIN) and Dysprosium (Dy): hence, Cindy. So today I learned something new: Dysprosium is a rare element with a silver lustre. This entry was posted in science, science communication, writing and tagged rhetoric, science. Bookmark the permalink.